Odd things happen to Archie every day. Some very odd things. On Monday, a piano rolls down the hill and traps his new friend Cyd in her mum’s car. And then a lorry tips a load of gravel on top of it. At least Cyd finds it exciting. Though of course she doesn’t believe that this sort of thing happens to Archie every day. Until Tuesday, when Archie finds a dead dog in his pocket . . . Poor Archie. But as he soon discovers, if odd things have to happen to him, it’s a lot better if they happen when Cyd's around. Join Archie and Cyd for a whole week’s worth of completely surprising and outrageously funny escapades. 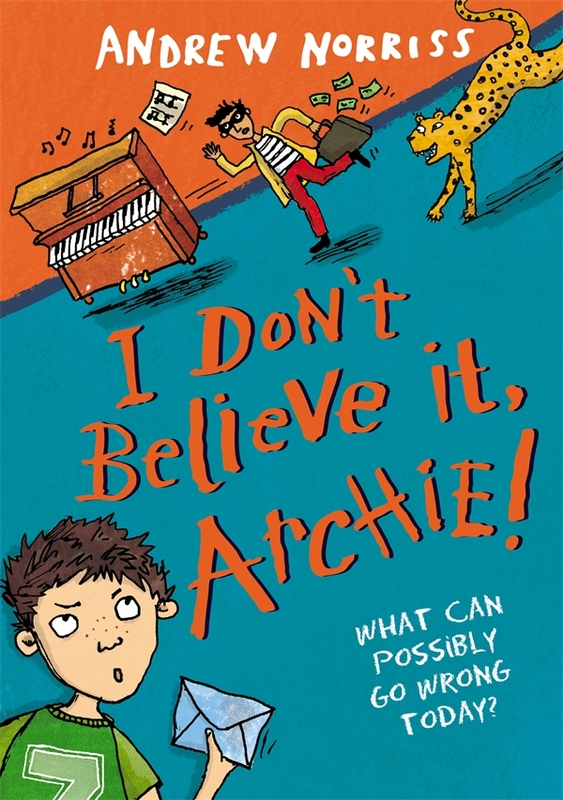 Meet Archie, the boy whose life is anything but boring! With Archie, a walk to the shops for milk can turn into an unforgettable adventure. In this book we follow Archie for one week, and on each day things get more and more preposterous. Needless to say, Archie's Mum wonders why Archie can't seem to complete any of the errands he is sent on. On Monday he saves a girl from being trapped in her car by a runaway piano, but then, the girl and a helpful man in a green raincoat who are in the car, get accidentally covered in gravel. That's not all...as the wife of the man in the green raincoat is reporting her missing husband to the police...The girl he saves is Cyd, and she then joins him each day, eager to see what will happen. On Tuesday, a series of misunderstandings sees Archie accused of killing a neighbours beloved pooch, and it’s only Cyd, who happened to be filming from across the road, that proves his innocence. On Wednesday, he tries to return his books to the library, only to have his hands superglued to the library doors, that the librarian had set up for herself, as a protest to the library being closed down. On Thursday, he finds a bag full of money, and he is mistaken for a kidnapped victim. On Friday, when Archie sets out looking for his little sisters toy lion, he finds it in a neighbours garden, only to find out that the old man actually has a real life leopard in the house, and Archie and Cyd find themselves trapped. On Saturday, he even gets mixed up in a robbery at the local shops, and again Cyd comes to his rescue, as she has recorded the goings on…as she has learned that it pays to have evidence where Archie is concerned. What a lovely review - so glad you enjoyed reading about Archie. Andrew Norriss will be so pleased. There are links to various teaching ideas and resources on my website and the next book in the Archie! series is Archie's Unbelievably Freaky Week is out in UK now. PS. I hardly like to mention it after such a good write up, but Norriss has a double s.
Thanks so much for your comments. I am very happy to know there will be more books about Archie! The spelling mistake has been corrected. SO embarrassed!